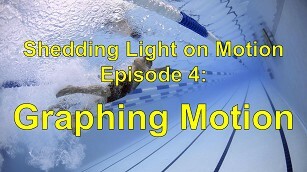 Shedding Light on Lenses (42 minutes) is the fourth video in the phenomenal Shedding Light series. 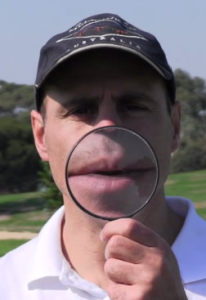 Conveniently broken up into nine sections, Science teacher Spiro Liacos uses fantastic visuals and animations to explain how convex and concave lenses produce images in a wide variety of situations. 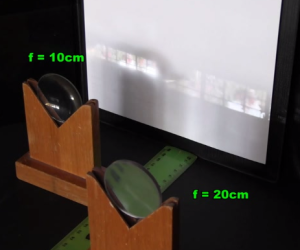 After a quick recap on refraction, Spiro illustrates how magnifying glasses work and how projectors produce giant images on giant cinema screens. He then looks into, quite literally, a tuna fish’s eye to show how our eyes work. After explaining how concave lenses produce images, he discusses how spectacles help people who have vision defects. 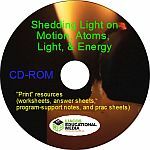 The first bonus feature takes a fun look at slow motion, fast motion and stop motion, and the second bonus feature, aimed at more advanced students, covers the mathematics of lenses and image formation. 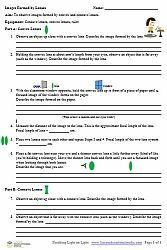 The program comes with fantastic activity sheets which will help students to learn the content and to develop new skills in drawing ray diagrams. 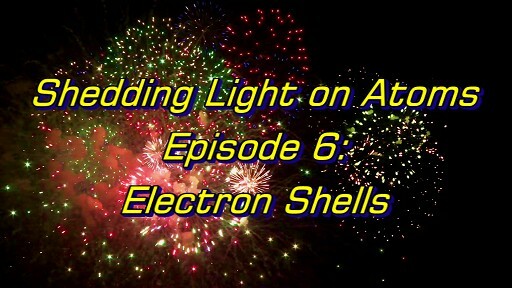 The preview video below contains a 6-minute excerpt followed by a 2-minute trailer. 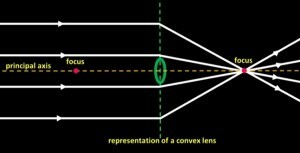 Part A: An Introduction to Lenses: A brief recap of refraction and an introduction to convex and concave lenses. 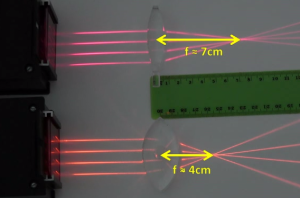 Part B: Convex Lenses: Convex lenses focus light rays inwards. 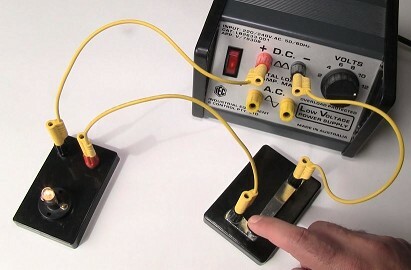 They can be used to start a fire and are used in so-called projector headlights. Part D: Images Produced by Convex Lenses (when the object is further than the focal length of the lens): Slide projectors, film projectors and electronic DLP projectors are the contexts in which the concept of a “real image” is demonstrated to students. 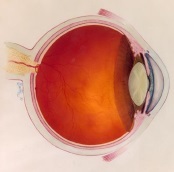 Part E: Eyes: The main focus of this section, pardon the pun, is how the lens and cornea produce an image on the retina, but the role of the other parts of the eye is also explored. Part F: Concave Lenses: Concave lenses produce diminished images. We show students why. 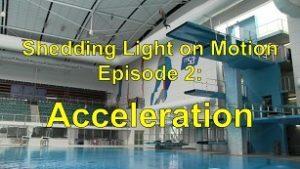 BONUS FEATURE 1 (5 minutes): Slow Motion, Fast Motion, Chick Flicks and Hobbitses: How is slow motion and fast motion achieved? 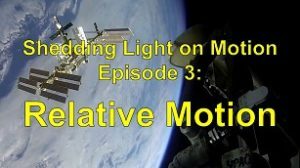 What is stop motion? Why are movies often called “flicks”? 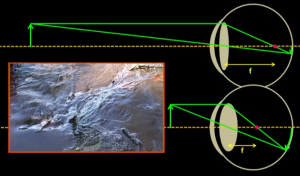 BONUS FEATURE 2 (8 minutes): The Mathematics of Lenses and Image Formation: Aimed at more advanced students, we show students how to use mathematics to calculate the position, magnification, size and orientation of an image in any circumstance. 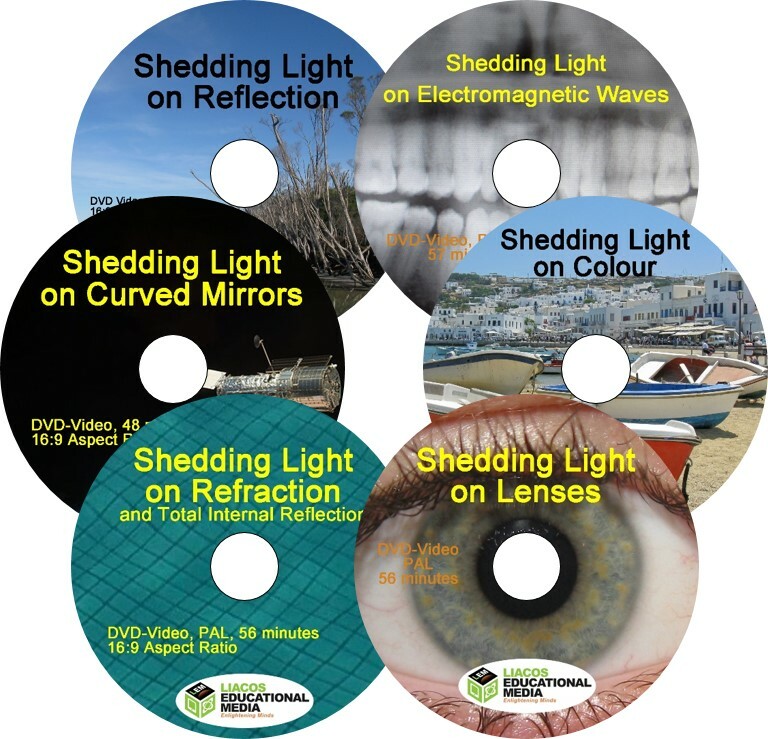 Shedding Light on Lenses – The Mathematics of Lenses (pdf) This sheet is aimed at higher-level students. 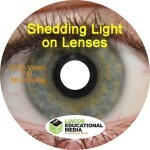 Students will need to view “Bonus Feature 2: The Mathematics of Lenses” first. The text below is more or less a transcript of the video. The still images are screen grabs from the video. Lenses. Lenses are everywhere. Cameras, projectors, glasses (or spectacles), magnifying glasses, and most importantly our eyes all rely on lenses to do what they do. Lenses come in two types: convex and concave, and they rely on refraction to change the direction that a light beam is travelling in. 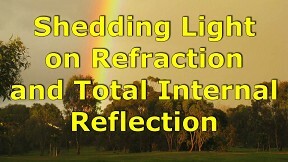 Refraction, if you recall from the Shedding Light on Refraction program, is the changing of a light beam’s direction when it passes from one transparent material to another. A lens is a piece of transparent material that has been shaped in a specific way to either focus light rays inwards or to refract light rays outwards so that they diverge. 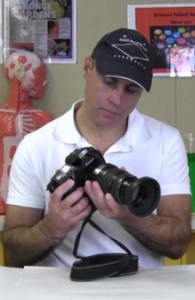 Lenses can produce images which are smaller than the object or images which are enlarged. And they can produce images which you can see on a screen. So how exactly do lenses work? 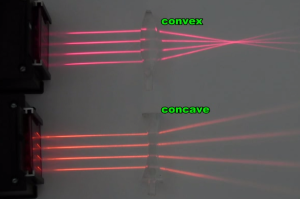 Well, let’s take a closer look at how they work, starting with convex lenses. A convex lens is made of glass or some other transparent material which is thicker in the middle than it is at its edge. 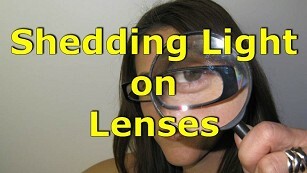 A magnifying glass is a convex lens as are the lenses inside our eyes. When parallel light rays hit a convex lens, they refract inwards towards a focus. The distance of the focus, or the focal point, to the lens is called the focal length of the lens. It’s often given the symbol “f”. The focal length varies depending on the curvature of the lens. A thinner, less rounded lens has a longer focal length than a fatter, more rounded lens. All lenses have two focal points, one on each side, since light can pass through lenses from both sides. The countless trillions of light rays coming from the sun are all spreading out, but the tiny tiny fraction of the light rays that hit the Earth are all travelling more of less parallel to each other, since the Earth is relatively small and orbits about 150 million kilometres from the sun. A convex lens can be used to focus the light rays coming from the sun to a single point, which gets really really hot. The focal length of this lens is 30 cm. 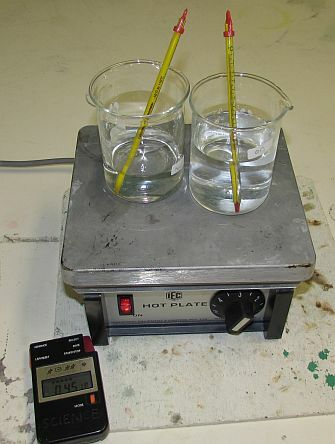 Within about 20 seconds the intense heat ignited the paper. If a light source is placed at the focal point of a lens, the light rays spreading out from it hit the lens and converge inwards, so that they exit the lens parallel to each other. 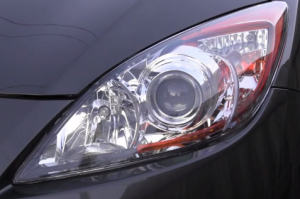 Some headlights, called projector headlights, use a lens to help focus the light rays coming from the lamp into a tight beam. In a somewhat complicated system, the lamp is placed between an elliptical mirror and a lens. The light reflects off the carefully shaped mirror towards the mirror’s focus point which is also the exact focus point of the lens. The light rays spread out from this point, hit the lens and refract in a way that makes them come out more or less parallel to each other. These types of headlights aren’t as common as the type that we saw in our Shedding Light on Curved Mirrors program, which use mirrors to reflect the light directly out onto the road. When a light ray passes directly through the middle of a lens, it doesn’t really change direction. 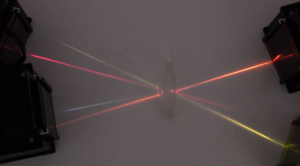 It does refract ever so slightly when it enters the lens but then it refracts back again when it leaves the lens, so in effect the path of the ray is virtually a straight line. 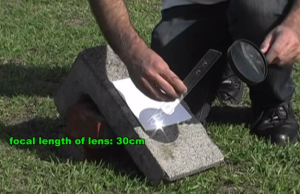 Part C: Images Produced by Convex Lenses (when the object is close to the lens). Now the main use of convex lenses is for the formation of images. Convex lenses produce different types of images, depending on how far the object is from the lens. When the object is close to the lens, specifically, when it’s closer than the lens’s focal point, the image produced is magnified and upright. We can use ray diagrams to see how they work. 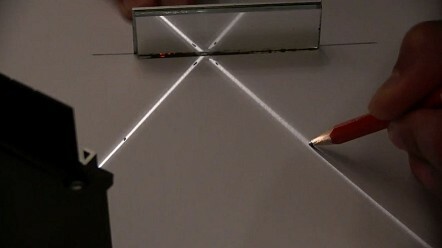 Now rather than drawing in a lens and then trying to calculate all the angles of incidence and refraction as the light passes through the lens, or drawing the light refracting twice, it’s much easier if we simply represent the lens with a straight line and draw a small convex lens to tell us what type of lens it is. We can also mark in this convex lens’s focal points on the lens’s principal axis which is the imaginary line passing straight through the middle of the lens. So, if you’re looking at an object that is behind the lens, but that is closer than the lens’s focal point, why does it appear magnified? To work it out, we need to use two so-called reference rays. The first reference ray is the light ray coming from the top of the object travelling parallel to the principal axis of the lens. When it hits the lens, it refracts towards the focus of the lens. If you’re looking through the lens, the light ray appears to be coming from somewhere up here. Our second reference ray is the light ray coming from the top of the object which travels through the exact centre of the lens. This light ray doesn’t change direction at all so it appears to be coming from somewhere in this direction. The point where the lines meet is where you have to look to see the top of the object’s image, so in fact the arrow appears to be here. Of course, there aren’t only two light rays passing through the lens, there are trillions, but because of the lens’s shape, every single one of them coming from the arrow head refracts in a way that makes them look as if they’re coming from up here. As a result, in this case, when you look through the lens, the object appears to be about one and half times bigger than it really is. What we’re seeing is an image of the object that is upright and enlarged. This type of image is called a virtual image. A virtual image is formed when light rays appear to be coming from a certain location but they’re not actually coming from that location. 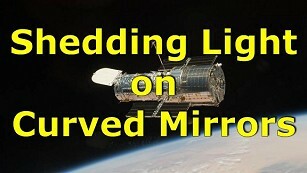 If we move a convex lens further and further away from an object, the image gets bigger and bigger. When the object is at a distance that’s equal to the focal length of the lens, the image goes blurry. When the object is at the focal point, the lights rays from any given part of the object come out of the lens travelling parallel to each other, so in fact you get no image at all. When the object is further away than the focal point, and the observer is back far enough as well, the image flips around, so that objects that are far away from a convex lens appear upside down. The fact that the image is upside-down isn’t all that important. What is really important about these types of images is that they can be seen on a screen and it’s these types of images that we’ll be looking into next. 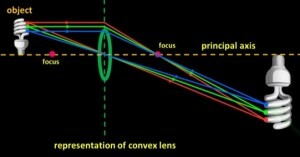 Part D: Images Produced by Convex Lenses (when the object is further than the focal length of the lens). When the object is far from the lens, specifically, when it’s further than the focal length of the lens, the image produced is said to be “real”, because the light rays are actually focussing on the screen. These “Real” images can be formed by lenses on, for example, the screen at the back of our eyes called the retina which is made of millions of light sensitive nerve cells. Real images are also formed by projectors, both in small scale presentations and at the cinema. Here, we’ve set up a light globe 35cm from a convex lens, which has a focal length of 30 cm. The way the light refracts when it passes through the lens results in an image of the light globe forming on the screen. In this case the magnified, upside down image is produced on the screen about 2 metres from the lens. Let’s examine what’s happening with a ray diagram. Our first reference ray of light travelling parallel to the principal axis refracts so that it passes through the focal point. The second reference ray passes through the exact centre of the lens and so it passes straight through it. 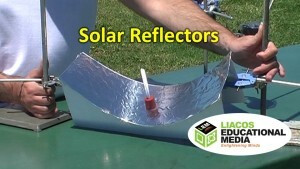 If we place a screen where the light rays meet, we’ll see an enlarged, upside down image of the light globe. Remember, there aren’t just two light rays. All the light rays coming from the top of the globe which pass through the lens meet up where our two reference rays meet. In fact, the image still forms even if, for example, the first reference ray was blocked, or if it was actually higher than the lens. There is, however, a third reference ray. Any light ray passing through the left-side focus refracts so that it ends up travelling parallel to the lens’s principal axis. This ray should also meet up with the others. These three reference rays can be used to work out where the lens will produce an image in any circumstance. However, just to show you that it’s not just the top of the object from which light rays are coming, let’s mark the light globe with three different colours, red near the top, green in the middle and blue on the bottom. 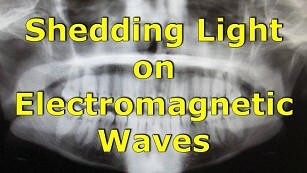 An upside down image appears on the screen, with the red, green and blue light all hitting the screen in a specific location. When the light hits the screen, it reflects off the screen into our eyes and we can see it. We can draw ray diagrams to follow the path of the different colours individually. The light coming from any given part of the object ends up at a specific location on the screen, so an image forms. But we don’t really have to draw heaps of light rays like we’ve just done here. Just two reference rays are enough to tell you where the image will appear, and you can use the third reference ray if you want to, just to check. By the way, if the screen is further back than where it should be, the light still focusses but then it keeps going until it hits the screen. Since by the time the light hits the screen it has already spread out you end up with a blurry image. If the screen wasn’t there at all, you wouldn’t even see an image; the light would just keep going, and wouldn’t reflect into your eyes. With projectors, whether they’re electronic or older-style slide projectors, it’s not the light globe that we end up seeing on the screen of course, but rather, the image-bearing element that is being illuminated by the light globe. 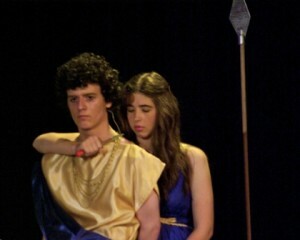 For example, this is an old slide photo. Slide photos, or slides, used to be fairly common but like audio cassettes, video cassettes, floppy discs and togas, they’re not anymore. I took this shot way back in 1989. No-one had a digital camera back them. 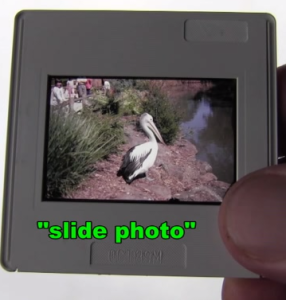 Slides are like see-through plastic photos. If a slide is illuminated from behind, the lens produces a magnified but upside down image on the screen, so here, I’ve made a simple projector. A real slide projector works in exactly the same way but uses a much brighter lamp along with a mirror to shine light onto the slide. The light coming from the near the top of the slide ends up near the bottom of the screen and the light coming from near the bottom of the slide ends up near the top of the screen. 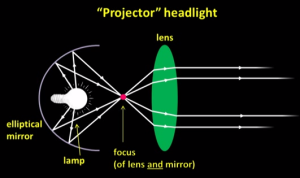 By the way, the convex lens in a projector is often called the projection lens. Since the image is upside down, the slide actually has to be placed upside down into the projector and we end up seeing its magnified image the right way up. 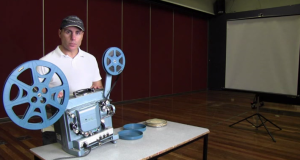 Older-style film projectors use this exact same principle as well. This particular film was shot way back in 1971. Not by me though. I was only three years old. When the film is played back, each frame is flashed up onto the screen one by one for a fraction of a second. The frames are flashed up so fast that when we watch them, our brain blends the images together, so there appears to be movement. 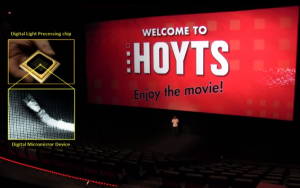 When the film is played back, 24 frames are flashed up onto the screen per second. Our brain blends the images together, so there appears to be movement. The light with its mirror is placed here and the projection lens is here. The film is fed between them. 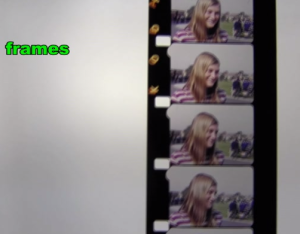 Movie film is made up of a series of slide photos, which are called frames. When it was filming, the camera was basically taking 24 photos, or frames, per second. When the film is played back, the frames are flashed up onto the screen in quick succession, at the same rate at which they were taken: 24 frames per second. Our brain blends the images together, so there appears to be movement. We can simulate the concept electronically, because video is also a series of photos, which are also called frames. Nothing on the screen you’re watching now is actually moving; there’s just a series of frames, each one lasting one and a half seconds. However, if they’re played back at the speed at which they were taken by the video camera, we perceive movement. 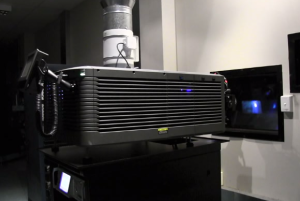 Cinema projectors continue to project most movies at 24 frames per second, but most projectors don’t use film anymore. Instead of using film or slides, modern projectors use an electronic device to create an image, which is then projected up onto a screen in a similar way to what we’ve already seen… with a really bright light source and a lens. The lamp in this cinema projector is very bright and produces lots of heat, so it even has a metal pipe to carry away the hot air. One way of creating the image that’s to be projected is using what’s called a Digital Light Processing chip or DLP Chip. 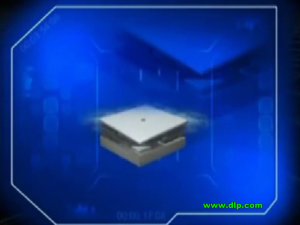 The rectangular silver-gray bit in the middle is called a Digital Micromirror Device or DMD. The DMD is made of millions of tiny mirrors, here shown with an ant’s leg to give you an idea of their size. DMDs were invented in 1987 by Dr Larry Hornbeck of tech giant Texas Instruments. 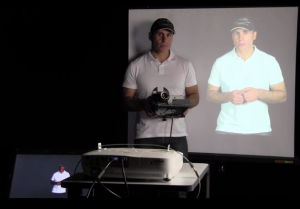 Each micromirror can pivot and this allows the DMD to create an image. Let’s take a look how it works. 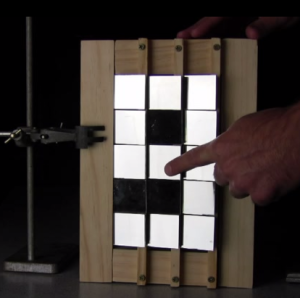 Here we’ve made a simple model of a Digital Micromirror Device using 15 small mirrors in a 3 x 5 array. The mirrors have been stuck onto hinges which allow the mirrors to be turned either towards a light source or away from it. If the single light source is placed to one side of the model DMD, and its dark on the other side, we have the beginnings of a display device. 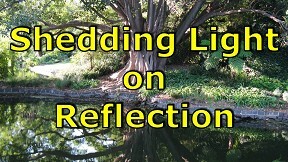 When the mirrors are angled a certain way, the reflected light makes them appear white. If they’re angled away from the light, they appear dark. Each mirror therefore represents one pixel of the image, so we can use our 15-pixel model DMD to create some simple images, in this case all of the numbers from 1 through to 9 and 0. With 15 pixels, we can also create many but not all of the letters of the alphabet. 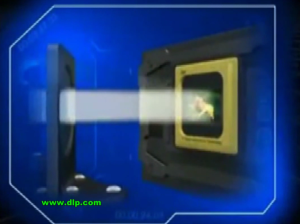 Now film or slide projectors shine light through each frame, whereas DLP projectors shine light onto a DMD which reflects the light back through the lens. 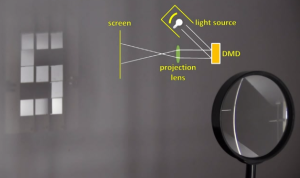 If we now place a projection lens in front of our model Digital Micromirror Device, and shine a light source towards it, we can project the DMD image onto the screen. Here we’re again re-creating the numbers from 1 through to 9 but now you can see them on the screen. A DLP projector uses a really bright light source, a DMD with millions of tiny mirrors, and a projection lens arranged in the way that we’ve set up our model. With millions of micromirrors, all controlled accurately by the encoded movie file on a hard drive, you can obviously get a highly detailed image. By vibrating really fast, the micromirrors in a DMD are designed not just to produce black and white but shades of grey as well. The last step is to produce colour and there are different ways of doing this. 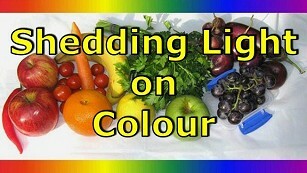 An electronic colour image is basically made up of red, green and blue pixels, red, green and blue being the primary colours of light. By changing the brightness of each red, green or blue pixel from its maximum all the way down to zero, or in other words black, you can get an image that appears to have millions of colours. To generate colour, most DLP projectors use a spinning colour filter, which allows first red light to shine onto the DMD, then green light and then blue light. The mirrors vibrate really quickly and project first the red, then the green and then the blue components of the image onto the screen one after the other, and again our brains put it all together and we perceive all the different colours. Cinema DLP projectors employ three DLP chips, one each for red, green and blue light. A prism is used to split the white light coming from the lamp into the three primary colours, which then illuminate one DMD each. 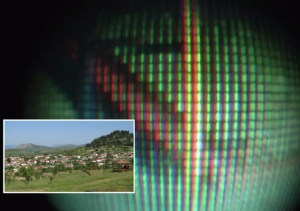 After the coloured light reflects from the DMDs, mirrors and prisms recombine it all just before it passes through the lens.When you watch a movie, you’re watching an enlarged image of the image that is formed on the DLP chips. You wouldn’t think at first glance that such a little device made up of tiny little mirrors could generate such a fantastic picture on a huge cinema screen, but it does. 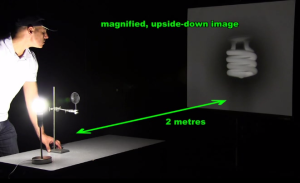 To produce a magnified image with any type of projector, the object has to be placed between the focal point of the lens and a distance that is twice the focal length, or to put it a little mathematically, between f and 2f. When the object is at a distance of two focal lengths away from the lens, the image appears the same size as the object. Using our three reference rays again in a ray diagram, we can see why this is the case. When we place a light globe 60 cm away from the lens which has a focal length of 30cm, the image of the globe is the same size as the globe itself and it’s 60cm behind the lens. If the object is a distance of at least two focal lengths away from our lens, the image is reduced in size. We say that the image is diminished. We can see why with a ray diagram. As an object gets further and further away from the lens, the upside down image gets closer and closer to the lens’s focal point. The easiest way to work out a lens’s focal length is to create, on a screen, an image of something really far away, at least 10 metres or so. The distance of the focussed image to the lens when you do this is equal to the lens’s focal length. 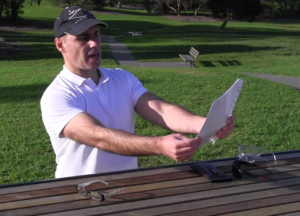 The lens on the left has a focal length of 10cm while the lens on the right has a focal length of 20cm. This kind of diminished, upside down image is produced by our eyes, so it’s our eyes that we’re going to look into next. The eye is truly a marvel of nature, but how exactly does it allow us to see things? Well, let’s take a quick look at some of the structures of the eye, and explain what they do and how they work. We’ll be looking at human eyes of course, and the eyes of this tuna fish. This eye is surrounded by a fair bit of fat which helps protect the eye. Our eyeballs also have fat around them to help protect them. We’ll remove the eye to allow us to examine some of its features. It’s kind of disgusting but it’s amazing at the same time. Back in the old days, if you wanted to eat any kind of meat, you had to… process it yourself. A human eyeball is mostly white. The outer-most layer is called the sclera. At the front of the eye is a see-through section called the cornea, which lets light into the eye. The cornea is very hard to see because it’s so clear. Because of its curved shape it’s actually a convex lens and so it plays a major role in producing images like we’ve already seen. The cornea of the tuna’s eye is fairly flat compared to the cornea of a human eye. Behind the cornea is the iris, which can come in a variety of colours. The iris forms a coloured ring which controls how much light enters the eye. The pupil, the black spot in the middle, isn’t an actual thing, it’s just the hole in the iris which allows light to enter the eye. In the dark, the iris opens and the pupil is said to dilate so that more light can enter the eye. In bright light, the iris closes a little and the pupil is said to constrict. This ensures that not too much light enters the eye. Here we’re using an infrared night-vision camera to see what my iris and pupil look like in the dark. We’re also using a normal camera at the same time. My pupil is quite dilated in the dark, but when the lights are switched on, my pupil constricts. When the lights are switched off again, the pupil dilates. The iris continuously adjusts the size of the pupil as lighting conditions change. Behind the iris is another lens which is usually called, quite simply, the lens. 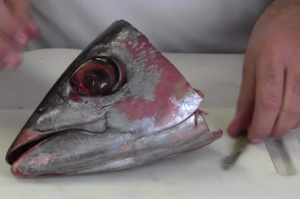 We can take the lens out of this tuna’s eye. The jelly-like stuff that fills our eyes is called the vitreous humor. It helps the eye to keep its shape. There’s the lens. 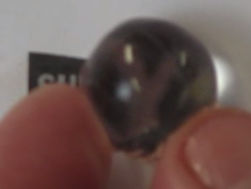 It’s a little, roundish see-through ball which is actually a convex lens. After a quick wipe down, we can see that the lens produces an upside down image of my finger. And, just like any other convex lens, it also acts as a magnifying glass for objects that are closer than the focal point. 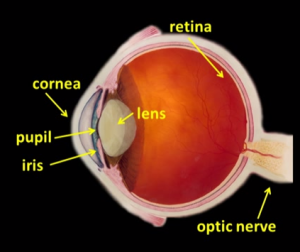 The lens and the cornea produce an image on the retina, at the back of the eye. The retina is made of millions of tiny light-sensitive nerve cells. It’s dark because it absorbs the light that hits it. If you’re looking at say a red, green and blue object, the red light reflecting from the red part ends up focusing about here, the green light from the green part ends up focussing about here, while the blue light reflecting from the blue part ends up focussing about here. An upside down image forms. 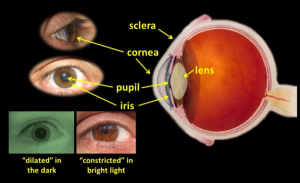 We have three types of light-sensitive so-called cone cells on our retinas. 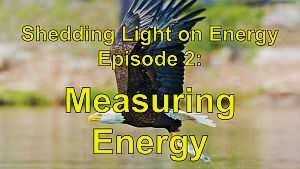 Some are more sensitive to light at the red end of the visible spectrum, some are more sensitive to light in the middle of the spectrum and some are more sensitive to light at the blue end of the spectrum. When light hits them they send the information off to the brain via the optic nerve. You can see part of the optic nerve here, still attached to the retina. The fact that the image is upside down is irrelevant. It’s the brain that processes the data and allows us to tell what we’re looking at and where it is. Our Shedding Light on Colour program has more information about colour and the way we perceive it, but let’s now focus on how we focus. Unlike the cornea, which keeps its shape, the lens is attached to tiny muscles which can pull on it to make it fatter, or which loosen to make it thinner. This is what allows the eye to focus. If you recall from earlier on, a thinner convex lens has a longer focal length, while a thicker convex lens has a shorter focal length. The thickness of the eye’s lens changes depending on the distance of the object you’re looking at. So, let’s say that you’re looking at something far away. Using what up until now we’ve been calling our second reference ray, we can determine where the top of the image will form on the retina. Our first reference ray has to hit the same spot if the image is to be focussed, so we can now mark in the lens’s focal point. If on the other hand we’re looking at something up close, the lens has to adjust. Once again, using our second reference ray first, we can show where the top of the image will form. Now, using our first reference ray, we can mark in the focal point. 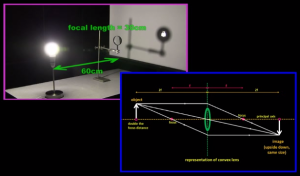 By comparing the two diagrams we can tell that when you look at something up close, your lens has to thicken up to refract the light rays more, but when objects are far away, the lens has to thin out. Now, even though the lens is called the lens, both the lens and the cornea act as lenses, and most of the focussing is, in fact, done by the cornea. The lens simply fine tunes the eye’s focus. Just to keep it simple though, our diagrams here have ignored the focussing effect of the cornea and are just showing the focussing effect of the lens. However, this diagram is a little exaggerated. No-one can really focus on something that’s as close as what we’ve shown here. There’s a limit to how much the lens can thicken up. The nearest something can get to your eye and remain in focus is called your eye’s near point. The near point of my right eye is about 19cm. Our eyes and our brain work together to continuously adjust the thickness of the lens as we look from one thing to another. This process is called accommodation. 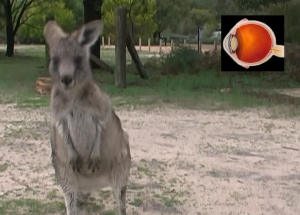 Later on in the program, we’ll look at why some people need to wear glasses. So just recapping, when something is far away, our lenses are relatively flat. As the object gets closer and closer, the little muscles pull on the lens and it gets thicker and thicker. This ensures that the image on your retina remains focussed. If the object moves away again, your lens thins out again. Cameras also use lenses to produce images on a screen. The light is focused by the lens onto a tiny electronic screen which sends off electrical signals to the camera’s memory when light falls on it. 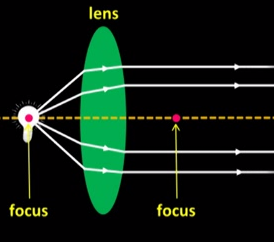 To focus, the lens doesn’t get fatter or thinner like it does in the eye; it moves backwards and forwards. Most cameras have more than one lens, which allows them to zoom. Also, multiple lenses made with slightly different types of glass produce better pictures. Concave lenses are lenses which are thinner in the middle than they are at their edge. Concave lenses always produce images which are upright and diminished. If something is up close, its image in the concave lens looks smaller, and if something is far away, its image in the concave lens looks smaller. Let’s use ray diagrams to work out why. When parallel light rays strike a concave lens, they diverge, or spread outwards. But the lens is shaped so that all the rays diverge as if they’re coming from a certain point. This point is called the lens’s virtual focus. 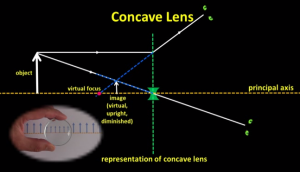 The focal length of a concave lens is the distance from the virtual focus to the lens. Once again, rather than using a large diagram of a concave lens, we’re simply going to represent the lens with a dotted line and a small concave lens shape in the middle. 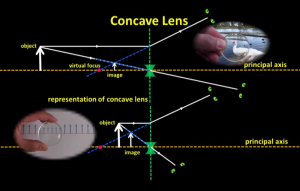 We’re also going to mark in the concave lens’s virtual focus on the lens’s principal axis. We’re also going to use a simple arrow as our object to simplify the diagram as much as possible. 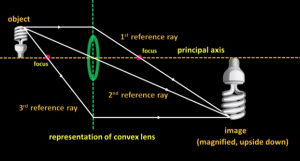 The first reference ray we draw is the ray that travels parallel to the lens’s principal axis. When it hits the lens it refracts upwards so that appears to an observer to have come from the direction of the virtual focus. Our second reference ray is the light ray that hits the exact centre of the lens, which, like the second reference ray for convex lenses, passes straight through the concave lens. An observer looking from this direction has to look along the line of sight shown. This point here is the point where both observers think the light is coming from, so the image is in fact here, virtual, upright, diminished and on the same side of the lens as the object. And of course there aren’t just two light rays. The ones we’ve drawn are just our reference rays. 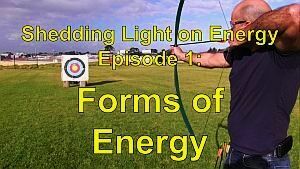 In fact, every light ray coming from the top of the object which passes through the concave lens refracts in a way that makes it look as if it’s coming from here. 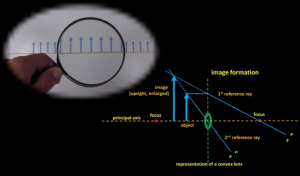 Whether the object is far away from the lens, in the ray diagram here it’s more than two focal lengths from the lens, or fairly close to the lens as it is in the bottom ray diagram, where the object is within one focal length, the image always appears upright and diminished. One of the most common uses of concave lenses is in the glasses, or spectacles, used by people who are short sighted. 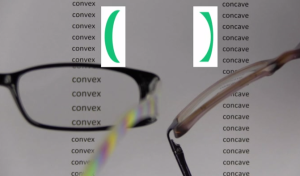 Convex lenses, on the other hand, are used in the glasses worn by people who a long sighted. 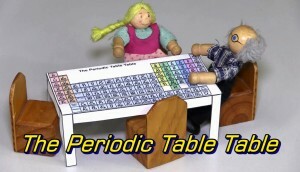 Let’s take a look at how they work. There are many types of vision defects but two very common ones are short-sightedness and long-sightedness. People with short sightedness can see things short distances away, but have trouble focussing on things that are far away. People with long sightedness can see things long distances away but have trouble focussing on things which are up close. Let’s see why. We’ve already seen that to focus on something up close, we have to thicken up our lens, so that the light refracts more and focusses on the retina. People who don’t need glasses and people with short sightedness have no trouble doing this, although, as I said earlier, the diagram is exaggerated. I f you’re looking at, say, a red arrow with a green dot at the top, all the light coming from the green dot is focussing at a tiny spot on the retina. The cone cells that are sensitive to green light send that information off to the brain. Other parts of the retina tell the brain that red light, in this example, is hitting them. The image is focussed. As the object gets further away though, the lens is supposed to become thinner. However, the lens of a short-sighted person can’t thin out enough, so the light is still refracted too much when they’re looking at distant objects. We can see in this case that the green light coming from the green dot focuses at a point in front of the retina, here in this animation, and then spreads out before finally hitting the retina. The image is blurry. Instead of a tiny group of cone cells detecting the green light, you get a wide area of the cone cells detecting green light. And, of course, the now dispersed green light overlaps with all the other light as well. Remember, we’ve just shown two light rays to keep it simple. In fact all of the trillions of light rays that pass through the lens end up focussing in front of the retina, and then keep going until they hit the retina. To correct this problem, people with short sightedness wear concave lenses. A concave lens spreads out the incoming light rays just before they reach the eye. These light rays are then refocused by the cornea and the lens so that they focus exactly on the retina. 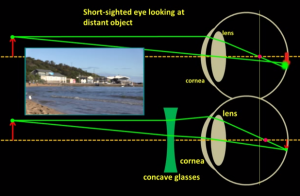 We can see here that by wearing concave lenses, the combined focal length of the concave lens and the cornea and the lens of the eye becomes longer, allowing a short sighted person to focus on distant objects. 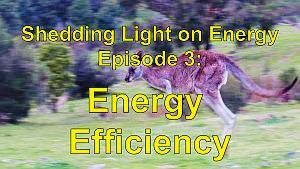 We can simulate the effect with actual rays of light. 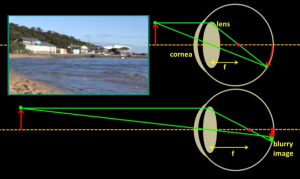 If we have our cornea and lens focusing the light too much, placing a concave lens in front of the two convex lenses extends the focal length. Which is what you need to see distant objects. It’s pretty obvious here, that the lenses in these glasses are concave, just like the laboratory concave lens. People who are long sighted have no trouble focusing on distant objects. However, if the object gets too close, their lens can’t thicken up enough. As a result, the light rays reach the retina before they have a chance to focus. Once again, instead of the light focusing at a tiny point on the retina on a tiny group of cone cells to produce a focussed image, all of the green-light-sensitive cells along this whole arc detect green light, so the person sees a blurry image. To correct this problem, people with long sightedness wear convex lenses. A convex lens focusses the light rays a little just before they reach the eye, and then the cornea and the lens focus the light even more so that a sharp image forms on the retina. 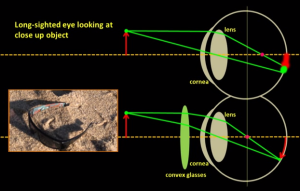 We can see here that by wearing convex lens glasses, the effective focal length of the eye shortens, which is necessary for viewing objects up close. 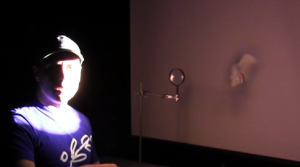 Once again, using actual light rays, we can see that adding an additional convex lens to our pretend cornea and lens produces a shorter focal length. Many people become long sighted as they get older. As we age, our lenses become less flexible so it becomes harder for the little muscles inside our eyes to pull back on the lenses to make them thicker. It’s not uncommon for people in their forties or fifties to start using what are often called “reading glasses”. When looking at distant objects, they might not need glasses, but when they sit down to read, their lenses can’t thicken up enough, so they put on their reading glasses, which are actually convex lenses. If they don’t have their reading glasses with them, they often hold the paper as far back as possible, in an attempt to focus on the text. So many people need reading glasses that many pharmacies even sell them off the rack. They come in different strengths, so you just choose the one that suits you. You can tell pretty easily that the lenses in reading glasses are convex. By the way, the lenses in the glasses are usually curved, but because they’re thicker in the middle than they are at the edge, they’re still convex. Sunglasses and safety glasses are usually curved too, but the thickness of the plastic doesn’t change. The concave lenses in glasses for short-sighted people are also usually curved, but they’re of course thinner in the middle than they are at their edge. Contact lenses work in the same way as glasses. They have to be curved so that they fit over the cornea, but they too come in either concave or convex form. This contact lens is concave, which means that it’s been designed for someone who is short sighted. Many people who have trouble focussing undergo corrective laser eye surgery, where a laser is used to actually change the shape of their cornea. For example, people who are short-sighted have their corneas flattened out a little, so that the incoming light rays refract less. Having the procedure doesn’t necessarily mean you’ll never wear glasses again, but some people think it’s worth doing. So there you have it. 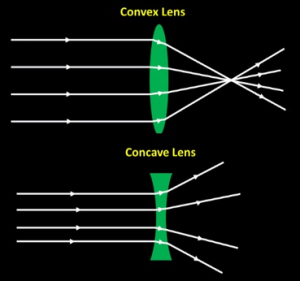 Concave and Convex lenses. What wonderful things. We’ve already seen that film and video is made up of a series of photos, called frames. Movies are usually shot at 24 frames per second and video is usually shot at either 25 or 30 frames per second. 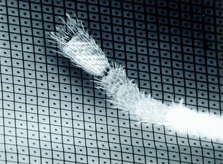 A video file shot at 25 frames per second and then played back at 25 frames per second appears to display movement at normal speed. However, if you take, say, 1 photo every four seconds as the photographer did here, and put them into movie editing software so that they’re played back at 30 frames per second, you get what’s called time-lapse photography. Everything seems speeded up. Depending on the movement of the object, it can often look very smooth. If you take a photo of something that is actually not moving, then move the thing a little, then take another photo and so on, and you then then play back the photos in quick succession, you get what’s called stop motion, or Claymation. Notice here that the caterpillar tracks aren’t actually moving. In the year 2000, the movie Chicken Run, about a group of chickens who make plans to fly the coup when they discover that their owners plan to turn them into meat pies, used Claymation very effectively to create the appearance of movement. What you’re seeing is not computer generated, these are real fake chickens. If you’ve shot a video at 25 frames per second, and then want to speed up the action so that it plays twice as fast, the editing software simply plays every second frame. At higher speeds, the software might play only every third frame for example. This usually results in movements that are jerky and even comical. 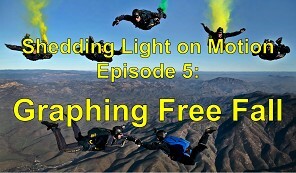 To get slow motion at say 50% speed, the software simply plays each frame twice. To slow the action down even more, the software has to repeat each frame three times or even more. It starts to look a little jerky because it gets to the point where we can distinguish between the individual frames, since they’re on screen for so long. 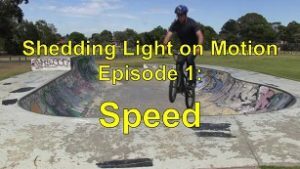 To get high quality slow motion, you really have to shoot at for example 100, 200, 300 frames per second, and then play the film back at 25 frames per second. Fast moving objects, in this case the hummingbird’s wings don’t move very far between each frame, so the resulting movement is smooth. 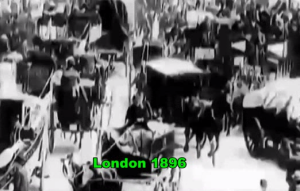 About 120 years ago, when film cameras were first invented and used to make movies, it was quickly realized that you needed at least 12 frames per second to produce a reasonable representation of movement. Because the frames rates often varied, and because the camera often produced frames with different brightnesses, and because the projector technology wasn’t all that good, audiences would see plenty of flickering as the film would flick from one frame to another. As a result, the word “flick” was often used to describe a movie, as in “do you wanna go see a flick?”. Though movies definitely don’t flicker these days, the word “flick” still gets used occasionally, and the expression “chick flick” is definitely still going strong. Though the technology wasn’t as good, there was still plenty of creativity. In the 1920s, 24 frames per second became the standard frame rate for movies, but in 2012, director Peter Jackson’s movie The Hobbit: An Unexpected Journey was filmed at 48 frames per second. It was the first major movie to be filmed, and of course screened in cinemas, at 48 frames per second. 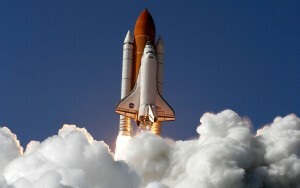 A higher frame rate is supposed to produce a clearer on-screen image when there’s fast action or when the camera pans. Who knows what advances in technology await us. BONUS FEATURE 2: The Mathematics of Lenses and Image Formation. Up until now, we’ve used ray diagrams to work out where an image will form in any given circumstance. We saw, for example, how enlarged upright virtual images form and how enlarged inverted real images form. Ray diagrams are obviously very useful, but is there a way of calculating exactly where an image will form? Well, yes there is. Mathematics is an incredibly powerful scientific tool. Let’s draw a simple ray diagram of an image forming and introduce the mathematical symbols that we’ll use. If we know the focal length of the lens, which is given the symbol f, and the distance that the object is from the lens, to which we’ll give the symbol u, we want to be able to calculate exactly how far the image is from the lens, and we’ll give this distance the symbol v. The height of the object is given the symbol H subscript o (Ho) while the height of the image is given the symbol H subscript i (Hi). What we need is a few equations which will bring all these quantities together. To do this we’re going to look at the similar triangles within this diagram, so let’s quickly review the mathematics of similar triangles. Two triangles are said to be similar triangles, if all their angles are the same. 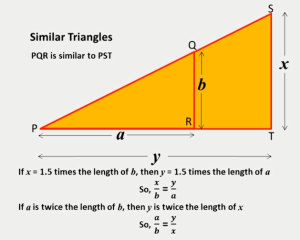 The smaller triangle PQR is similar to the larger triangle PST. All the ratios of the side lengths of the two triangles are therefore the same. Let’s label the lengths a, b, x, and y. If x is 1.5 times longer than b, then y must be 1.5 times longer than a. We can write x/b = y/a. In other words, the ratio of the heights is equal to the ratio of the lengths. Similarly, if a is twice the length of b, then y must be twice the length of x, or a/b = y/x The ratio of the side lengths of each similar triangle is the same. These two triangles are also similar triangles. The two vertically opposite angles here are the same, as are the two right angles of course, and so these angles must be the same as well. Once again, the ratio of x to b is the same as the ratio of y to a, and the ratio of a to b equals the ratio of y to x. So, getting back to our ray diagram, let’s write our first equation. 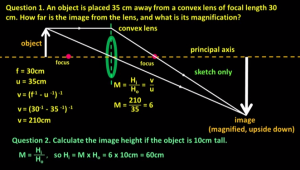 The magnification of the image, M = the height of the image over the height of the object, that is Hi/Ho. To bring in the values of v and u, we use similar triangles. These two red triangles are similar triangles, since all the angles are the same. So, the ratio of the heights of the two triangles is equal to the ratio of their lengths, so Hi/Ho = v/u. Magnification therefore = Hi/Ho which = v/u. That’s our first equation, but we now need to bring in f, the focal length. These two triangles are also similar. This length is actually Ho and this length is v-f. Once again the ratio of the heights of the triangles = the ratio of the lengths of the triangles, so Hi/Ho = v-f over f. Since Hi/Ho equals v/u and v-f/f, it follows that v/u = v-f / f. That’s our formula, but you can’t have a formula with two vs and two fs in it so we need to change it around. By cross multiplying we get vf = u(v-f). Expanding the brackets gives us vf = uv – uf. Now what? Before we do the next step, I want to show you this simple equation: 12 = 18 – 6. If we divide every term by 2, we get 6 = 9 – 3. The equation still holds. If we divide every term by 3, we get 4 = 6 – 2. That works too. So if we divide every term in this equation by uvf, and then cancel, we end up with 1/u = 1/f – 1/v. Rearranging slightly we end up with 1/f = 1/u + 1/v or f-1 = u-1 + v-1. This is the form that I always remember the formula in, but you can rearrange it so that v-1 = f-1 – u-1 and therefore v = (f-1 – u-1)-1. Now all that might be a lot to take in, and I could have just told you all the formulas, but now you know how we derived them. Let’s do an example. Question 2. Calculate the image height if the object is 10cm tall. The magnification = Hi/Ho so Hi = M x Ho = 6 x 10cm =60cm. Just a few more things. One, if the lens is concave, the focal length is negative. Two: If you calculate that your v is negative, it means that the image is on the same side of the lens as the object. Three: If your magnification is negative, it means your image is upright, and finally Four: In everyday language we use the word magnification to mean enlarged. But, if you find that the magnification of an image is less than one (or between 1 and -1), it means the object is actually reduced in size, that is, it’s diminished. Remember most students learn a lot from teachers and from videos, but they learn even more when they practise things for themselves. Cone-response.svg (http://commons.wikimedia.org/wiki/File:Cone-response.svg) by w:User:DrBob and w:User:Zeimusu is licensed under CC BY-SA 3.0. 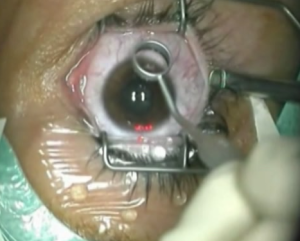 Lasik UOC.ogg (http://commons.wikimedia.org/wiki/File:Lasik_UOC.ogg) by Philos2000 is licensed under CC BY-SA 3.0. 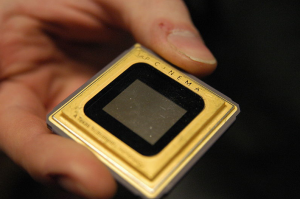 Texas Instruments DLP digital micromirror device (detail) – (9).jpg (http://commons.wikimedia.org/wiki/File:Texas_Instruments_DLP_digital_micromirror_device_(detail)_-_(9).jpg) by yellowcloud is licensed under CC BY 2.0. 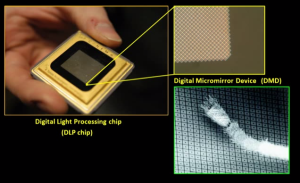 Digital Micromirror Device – Chip.jpg (http://commons.wikimedia.org/wiki/File:Digital_Micromirror_Device_-_Chip.jpg) by Andrew Hitchcock is licensed under CC BY-SA 1.0. The Clip Art in this program is from Microsoft.